Very young children learn through seeing, hearing, touching, feeling, and moving. 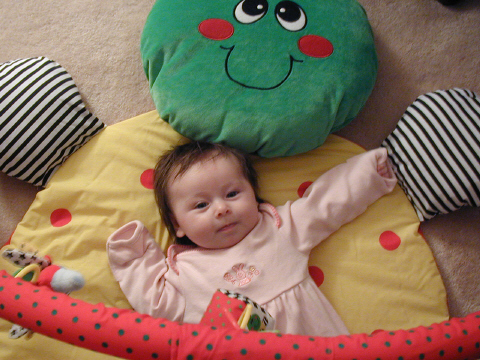 Our infant program includes visually stimulating and tactile toys, music, colorful mobiles, mirrors, soft huggable "friends", as well as toys and equipment to promote muscle development.These are just a few of the many activities to stimulate your baby’s intellectual, physical, and emotional growth. All activities revolve around your baby's individual sleeping and feeding schedule. Little Puzzlers participates in the USDA Food Program insuring that your baby enjoys nutritious meals and snacks. Our caring and responsive teachers/caregivers hold, rock, sing and talk with your baby, encouraging their emerging development. You will be constantly informed of your baby's activities and well- being with daily reports. The progress of your baby's intellectual, physical, social, and emotional development will be accessed and documented in your baby's record and shared with you during parent/teacher conferences.